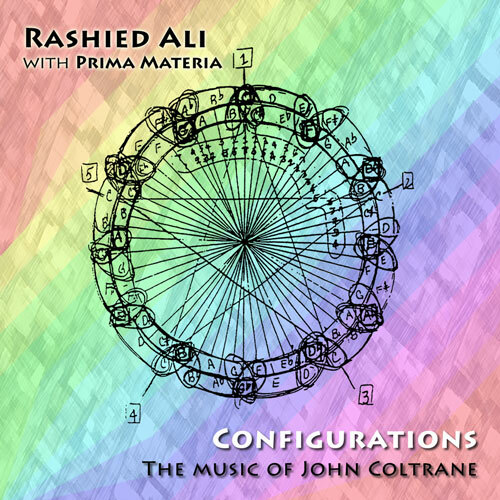 Originally recorded on John Coltrane's sensational, futuristic 1967 recording, "Stellar Regions", Coltrane's drummer Rashied Ali joins the excellent group Prima Materia for new renditions of these songs. The cover picture is an original John Coltrane drawing of "Configurations" from the mid 60s when he developed a completely new scientifically proven harmonic system. "It's not that I didn't like what I did with Trane - that started this whole direction - but I believe I can't do it better than I did now. Now I feel in peace with this music," Rashied Ali said in an interview in early August 2009, before he passed away. In this band the saxophones of Louie Belogenis and Allan Chase often honor the sound and direction of Coltrane, but do not fear to offer a glimpse of more recent ideas. Greg Murphy, a multi-decade pianist collaborator with Ali, finds a natural approach to these not-so-common sounds without copying Alice Coltrane's strong original style. Overall, Configurations is an important historical update to what John Coltrane's late compositions, which are far from overplayed, can be forty years after the composer's untimely death in 1967.